Magic Ian is a 5 reel, 25 payline slot by Blueprint Gaming. It’s got a magic theme with a showman who promises to give you the best show of your life. His sleight of hand and skill at misdirection will have you in disbelief. This slot has a whooping 15 bonus features where 10 of these are activated at random during the main game. Mystery symbols, re-spins, 4 free spins rounds, expanding reels, wild reels, matching symbols and more fun lies ahead. Start your stakes from 25p to £125 per spin. Blueprint Gaming is a UK based company. in 2008 they were bought up by the Gauselmann group, a popular German company known for its smiling sun logo and operations in slots halls and casinos. The acquisition helped Blueprint form partnerships with large gambling corporations. Before the Gauselmann group came into the picture, little was known about Blueprint Gaming. This slot has a classical feel and design- the action is set in a beautiful old theatre. The reels have playing card suits and a few items you might find a magician using as props. These include top hats, cards, magic wands and flowers. Of course, there’s also a Magic Ian symbol which pays the highest value among the main symbols. The wild is represented by the rabbit and pays a value of up to 400 coins per line and can replace all the other symbols except the scatter. Expanding Reels feature- When this feature is activated, the game engine will expand 8 rows higher and come complete with 25 extra paylines for a total of 50. Levitation Spins feature- Extra symbols will float over the reels and with Ian’s help, they’ll drop onto the reels to help you form new winning combinations. Teleport Spins feature- An extra set of reels will be added increasing your chances of winning. Mirrored Reels feature- Matching symbols between the 2nd and 5th reels are shown. Chest Of Wonder feature- Magic chests found at the bottom of the reels will turn an entire reel wild. Symbol of Surprise feature- Special mystery symbols will be added to cover an entire reel and can pay on every line. Magical Streak feature- When this feature is activated, a re-spin streak is awarded. This will continue until no other matching symbols land. Shuffling Symbols feature- Ian will shuffle the symbols and transform a losing spin into a winner. Bonus Boost feature- Extra bonus symbols will be added to the reels. -Cash Prize feature – a multiplier reward is applied to your total stake amount. 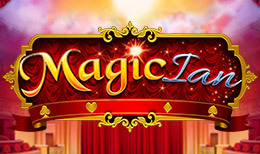 -Magic Rope Free Spins feature – Your free spins will occur on a 5 reel, 3 row machine. Keep an eye out for a magic rope wild which transforms the entire reel wild and increases the rows from 1 up to 8. -Teleport Spins feature – Another set of reels is added during this feature. If a teleport wild lands on 1 set, it morphs into the same location on the 2nd set. -Levitation Spins feature – overlay wilds will float onto the reels and create winning lines. The reel set expands here also and offers up to 8 rows and 50 paylines. -Metamorph Spins feature – Metamorph wilds are added onto the 2nd, 3rd and 4th reels. When the wilds land, the number of rows will expand from 1 up to 8 rows. An extra free spin is also added to your total tally. If any wilds hit, they remain sticky for any amount of free spins remaining. This slot has quite a range of features and you can expect to land the main game modifiers often. The Circle of Magic free spins won’t be easy to land though. If you’re like slots that are easy on the eye,then this one’s for you.